WASHINGTON -- North Carolina House Speaker Thom Tillis captured the nomination to oppose imperiled Democratic Sen. Kay Hagan Tuesday night, overcoming anti-establishment rivals by a comfortable margin in the first of a springtime spate of primaries testing the strength of a tea party movement that first rocked the Republican party four years ago. In Ohio, Cuyahoga County Executive Ed FitzGerald won the Democratic nomination to challenge Gov. John Kasich in the fall, while U.S. House Speaker John Boehner, a Republican, rolled to re-nomination for another term in Congress, his 13th. On a night that was kind to Republican incumbents, GOP Rep. Susan Brooks of Indiana easily fended off a challenge from the right, rolling up 75 percent of the votes in a three-way race. First-term Rep. David Joyce of Ohio had a slightly tougher time but was running well ahead of his tea party rival. In North Carolina, Tillis was winning about 48 percent of the vote with ballots counted in 46 percent of the state's precincts. He needed 40 percent to avoid a July runoff. Greg Brannon was running second and Mark Harris third. Also in North Carolina, former "American Idol" runner-up Clay Aiken seized a narrow lead as he sought the Democratic nomination to oppose Republican Rep. Renee Ellmers in the fall. A Democratic runoff was possible. Elsewhere in the state, Rep. Walter Jones, an anti-war Republican, was running ahead of his challenger. Democratic State Rep. Alma Adams was comfortably ahead for a pair of nominations at the same time: in a special election to fill the unexpired term of former Rep. Mel Watt, and also for the November ballot in the heavily Democratic district. Hagan, whom Republicans have made a top target in their drive to win a Senate majority in the fall, won renomination over a pair of rivals with about 80 percent of the primary vote. Tuesday marked the beginning of the political primary season in earnest, and over the next several months Republicans will hold numerous contests featuring incumbents or other establishment figures against tea party challengers. Some of the races are in states where the identity of the party's candidate might mean the difference between victory and defeat this fall, such as Alaska, Georgia, Iowa and Kentucky. In other areas, it will matter less, including Kansas, Mississippi, Nebraska, Oklahoma and South Carolina. In the marquee race of the night, Tillis and a pair of political novices, newcomers, obstetrician Greg Brannon and Mark Harris, a Baptist pastor, led a field of eight candidates vying for the right to take on Hagan, a top target for Republicans angling for control of the Senate in the fall. Tillis ran as a conservative with the support of the U.S. Chamber of Commerce, the National Right to Life Committee and former presidential candidate Mitt Romney, while Brannon had the backing of Sen Rand Paul of Kentucky, a tea party favorite. Harris countered with former Arkansas Gov. Mike Huckabee, whose popularity with evangelical voters briefly made him a force in the race for the 2008 presidential nomination. State law set a runoff for July 15 if no candidate gained more than 40 percent of the vote, an outcome party officials said they hoped to avoid in order to maximize their chances against Hagan. One voter, Debbye Krueger of Salisbury, North Carolina, said, "I think the tea party has pulled the right so far to right that they're falling off the cliff. And, anybody who's moderate or uses any ounce of decorum to make a logical decision not based on political affiliation is demonized." Dan Coutcher, a chaplain at North Carolina State University, said he voted for Brannon, who he said had delivered his grandchildren. "I like him more than I like Tillis. I tend to not like long-term career politicians," he said. Boehner's nomination to a 13th term in the House was never in doubt, despite challenges from tea party adherents J.D. Winteregg and Eric Gurr. His seat is safely Republican for the general election, as well, and it will be up to fellow Republicans - assuming they hold their House majority - to decide if the 64-year-old Ohioan serves a third term as speaker. Kasich was unopposed for nomination to a second term as governor, a race viewed as a possible prelude to a 2016 run for the White House. Fitzgerald wasted no time in pocketing his primary triumph, blasting out an email that declared, "As of tonight, this race is officially between me and Gov. Kasich." North Carolina hosted the most closely watched race of the night, at the intersection of the tea party's long-running challenge to the Republican establishment and the GOP campaign to gain the six seats needed to win a Senate majority in the fall. Establishment figures made little or no secret of their desire for Tillis to prevail, fearful that any other challenger to Hagan could mean a replay of 2010 and 2012, when Republicans lost winnable Senate races in Nevada, Indiana and Missouri. 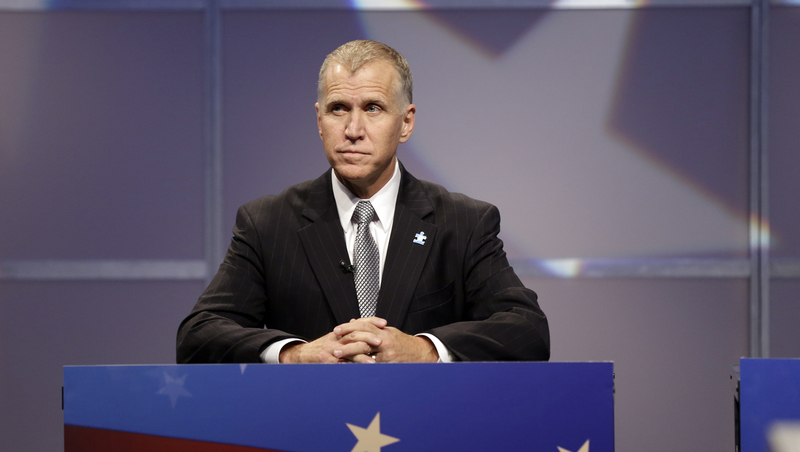 "You can't defeat Kay Hagan with a factionalized (party)," Tillis said at one point, making a case for his own nomination. Paul, whose upset victory in a 2010 primary in Kentucky served notice that the tea party was a force to be reckoned with, hailed Brannon. The first-time candidate is "a true believer and we need true believers in Congress," Paul said as Brannon battled the establishment. For his part, Harris damned Tillis with the faintest of praise, saying Monday the state assembly leader is the man to support "if you want an establishment ... style of United States senator, someone that is going to work in the system." Hagan is among the Democrats' most vulnerable incumbents in a campaign season full of them, a first-term lawmaker in a state that is ground zero in a national debate over the health care law that she and the Democrats voted into existence four years ago. Americans for Prosperity, a group funded by the billionaire Koch brothers, has run about $7 million worth of television commercials criticizing Hagan for her position on the law. If Republican Party leaders preferred Tillis, Democrats seemed to want anyone but him, or at a minimum, a runoff that would require Republicans to battle one another into midsummer. Hagan's campaign recently sent out a mass mailing that said Tillis had once called Obamacare a "great idea" - an obvious attempt to influence the outcome of the primary by holding down his support among conservative primary voters. Tillis favors the law's repeal, and in fact called the law "a great idea that can't be paid for." An outside group dedicated to electing Democrats ran a television ad assailing Tillis over severance packages that went to two members of his legislative staff said to have had inappropriate relationships with lobbyists.